Daniel Razon, dubbed as the Philippines’ Mr. Public Service and Kuya (older brother) Daniel, is host of several programs at UNTV 37, including his morning magazine-public service show Good Morning, Kuya. Prior to UNTV, he was news anchor, commentator and public service host with some of the biggest networks in the Philippines. He started work in the broadcast industry as DJ and radio announcer. Mr. Razon was born in Bulacan province, North of Manila, and was seen already with the gift in public speaking, paving his way to broadcasting. But his biography at his website revealed his present stints in media was miles away from his childhood dreams of becoming a medical doctor. One of the biggest influences to his choice of career was his uncle, Bro. Eli Soriano of the Ang Dating Daan group (officially registered as Members Church of God International). He completed his Mass Communications degree at the Centro Escolar University (CEU) after the EDSA Revolution of 1986. His first work after graduation was with an FM station in Angeles City, Pampanga. His other radio broadcast portfolio include disc jockeying with KYFM of Mabuhay Broadcasting System, Manila Broadcasting Corporation, DZRH and YESFM (then DWST). His radio moniker then was “Dr. Clark”. His biggest break in television followed after he served as station manager with Capitol Broadcasting. He began TV works with Channel 4 for six years as news presenter of the station’s Balita Ala Una with Luella de Cordova and host of “Dakila Ka, Pinoy,” a public affairs program heralding the greatness of Filipinos in various fields and expertise. At ABS-CBN he hosted a regular morning show with DZMM’s Gising, Pilipinas in 1997. 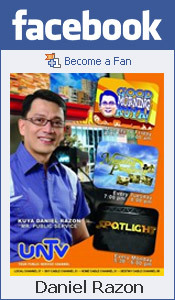 His other programs in this station include: Companero y Companera,” “Abogado de Kampanilya,” “Pulso Aksyon Balita,” “Hoy Gising,” and “Pasada Sais Trenta.” For the Global Filipinos, Kuya Daniel became a reassuring and soothing presence in the “Kamusta Kabayan” program of ABS-CBN International’s, The Filipino Channel (TFC). His landmark career in ABS-CBN opened the doors for countless opportunities. Kuya Daniel moved to another TV giant, GMA 7 in 2003 to join the daily morning news magazine program, “Unang Hirit.” In this station, he frequented some of the network’s news and current affairs programs such as “FrontPage” and “Saksi”. Currently he hosts and produces TV programs for UNTV 37. Among them is “Good Morning Kuya”. He also hosts the Bible-reading program in the same station titled, “Mapalad ang Bumabasa” (Blessed is he who Reads), Spotlight, and Munting Pangarap (Little Dream). Kuya Daniel Razon is also a member of the Press Photographers of the Philippines. To God be all the Glory because of them..